Indiana’s most current approved HIP waiver includes a work requirement that will affect approximately 95,000 enrollees. The work requirement will be phased in beginning in 2019. On February 1, 2018, the Centers for Medicare and Medicaid Services (CMS) approved an amended extension of Indiana’s Healthy Indiana Program 2.0 (HIP 2.0) Section 1115 demonstration waiver. Indiana’s waiver initially implemented the ACA’s Medicaid expansion from February, 2015 through January, 2018 by modifying Indiana’s pre-ACA limited coverage expansion waiver (HIP 1.0). Unlike other states that implemented the ACA’s Medicaid expansion through a waiver, Indiana’s demonstration also changes the terms of coverage for non-expansion adults (low-income parents and those eligible for Transitional Medical Assistance, TMA). The February, 2018 extension continues most components of HIP 2.0 and adds some new provisions. Enrolling adults who pay premiums in HIP Plus, an expanded benefit package with co-payments only for non-emergency use of the ER. Beneficiaries at or below 100% FPL who fail to pay premiums receive HIP Basic, a more limited benefit package with state plan level co-payments for most services. Restricting TMA eligibility to 139-185% FPL; those who otherwise would have qualified for TMA up to 138% FPL instead will be treated like expansion adults under the waiver for premiums and benefits. The February, 2018 waiver extension also waives the “institution for mental disease” (IMD) payment exclusion for short-term SUD treatment services for all Medicaid adults ages 21-64. The waiver extension does not continue the demonstration authority to test graduated copayments up to $25 for non-emergency use of the ER (instead, non-emergent use of the ER is subject to an $8 copay, which is within statutory limits with no waiver required). The waiver extension also does not continue the previous authority to use Medicaid as premium assistance for those with employer-sponsored insurance. Indiana is the first state to receive approval to impose a premium surcharge for tobacco users. Indiana is the second state to receive authority to impose a work requirement as a condition of Medicaid eligibility following CMS’s guidance released on January 11, 2018, and approval of the Kentucky waiver on January 12, 2018. Similar to Kentucky, Indiana requires payment of the initial premium (or expiration of the 60-day payment period for those at or below 100% FPL) prior to starting coverage and imposes a lock-out for failure to pay premiums as well as a lock-out for failure to timely renew coverage. As with Kentucky’s waiver, no operational protocols are required for Indiana to implement the new work requirement, a provision that is likely to have significant implications for beneficiaries’ ability to retain coverage for which they are eligible. While Indiana’s waiver includes numerous exemptions for certain individuals and good cause exceptions, as well as “state assurances” about implementation, these provisions are complex and will require administrative staff time and resources and sophisticated systems to implement. In addition, Indiana had requested changes to its healthy behavior incentive program that would include “completion of specified outcome milestones and targets”; however, these provisions are not discussed in the waiver renewal so it is unclear if these state is planning to move ahead with these changes. Implementation of new waiver provisions and understanding the impact of the waiver on enrollment, program costs and administrative costs will be important areas to watch. Indianapolis – Up to 70% of federal funding for the Health Centers program will expire on September 30, 2017. Without action by Congress to reauthorize funding, health centers will face immediate cuts. This would result in an estimated 55,000 Hoosiers losing access to care and approximately 9 million individuals nationwide due to layoffs and site closures. Non-profit community health centers ensure access to primary and preventive care at more than 180 locations across the state of Indiana to nearly 500,000 Hoosiers each year by leveraging state and federal dollars. Nearly 26 million Americans received care at a community health center. The federal program has existed for over 50 years with broad bipartisan support. The program expanded in recent years as the healthcare debate turned from coverage to access. Community health centers provide care to the most vulnerable populations in specially designated areas that have a shortage of health care providers or medical facilities. Congress must act now to stabilize and sustain health center funding on a long-term basis. Millions of Americans’ healthcare is in jeopardy and tens of thousands of jobs are at risk. Without a long-term fix, it is impossible for these small businesses to maintain financial or operational solvency. Learn more about community health centers at www.indianapca.org. Sign up as a health center advocate at www.hcadvocacy.org. Monday’s report on the Senate health-care bill from the Congressional Budget Office said that 22 million people would lose coverage under the plan and that coverage in the non-group market would become far stingier than it is today. By Tuesday the bill had been pulled back for revision. The quick sequence was revealing: Senators clearly could use some extra time to figure out how to bridge a giant gap between policy theory and reality. The CBO report illustrates how policymaking can become divorced from the reality of people’s lives. Here are three big examples of how the Senate health-care bill, as currently configured, may sound one way in theory (and in talking points) but would work out quite another way in practice. First, the bill phases out the Affordable Care Act’s 90 percent federal match for expanded Medicaid eligibility over four years, reducing it to each state’s regular matching rate. The theory is that this phase-down period would provide time for states to decide whether they want to replace the lost federal funds and continue their Medicaid expansions. But consider these estimates of how much it would cost states to replace those federal funds: California would have to come up with $12.5 billion when the phase-down is fully implemented in 2024, a 400 percent increase; Ohio would need $1.6 billion, a 272 percent increase; Nevada, $343 million, a 243 percent increase; and West Virginia, $178 million, a 168 percent increase. The impact on the other expansion states would be similar. There is no way states can replace funds of this magnitude. If the expansion states try to replace even a significant share of the money, they will be forced to increase taxes or make significant cuts to other parts of their budgets, including for public schools, higher education, environmental protection and corrections. And because the federal match would be phased out incrementally beginning in the first year, states would have every incentive to end or freeze their expansions quickly. The idea that a phaseout would give states time to plan and adjust is driven by a belief that states can operate Medicaid with far less money if they have greater flexibility. In this case, with funding cuts this large, it’s simply wishful thinking. That leads to reality gap No. 2: the theory that the 14 million people who are covered under the ACA’s Medicaid expansion could buy private coverage with the tax credits offered under the Republican plan, in effect privatizing the Medicaid expansion. This is the biggest reality check in the Senate bill. Let’s look at a typical adult covered by the Medicaid expansion. He is a 35-year-old man who lives in, say, Minden, Nev., makes $15,000 a year and may even have voted for President Trump. Under the Senate plan, he could buy a policy costing him about $400 per year after using his tax credit, but his plan would come with a deductible of more than $6,000 a year. (The Senate plan’s policies are calibrated to cover just 58 percent of costs.) On a $15,000 income, he cannot afford to get sick with a policy like that. Assuming he has a car to get to work, pays rent, eats food and otherwise has the same basic expenses as any other human being, such a policy would be far from affordable for him. In fact, this is why this hypothetical Trump voter was uninsured before Medicaid was expanded in his state; like millions of his counterparts across the country, he could not afford private coverage. The Senate plan also trims back the pool of people in the non-group market who will be eligible for tax credits, by reducing the threshold from four to 3½ times the federal poverty line. That leads to reality gap No. 3. Consider a 60-year-old woman in the town of Strong, Maine, making just less than $45,000 a year. She has high blood pressure, takes daily medication and needs regular monitoring because of her previous thyroid cancer. Under the ACA, she is eligible for a premium tax credit of about $7,000 and a comprehensive policy with a premium cost to her of about $4,500 in 2020, when the Senate health-care bill would take effect. Under the Senate plan, she would not be eligible for a tax credit. A similar plan under the Senate bill would cost her more than $15,000, or one-third of her income. Gaps between the theory and practice of policy are not some Republican creation. Under the ACA, many people have struggled with costs or were forced to change plans and provider networks annually to keep their premiums down. But the current Senate bill takes this divergence to a new level. Private insurance cannot be better than Medicaid if it is unaffordable; states do not have some magic way to cover millions of people with far less money. The bill may now be altered, and senators will certainly hear from constituents over the holiday recess. They should listen carefully to what they have to say. As it’s written, the Senate health-care plan would substantially widen the gap between policy theory and the real world — making coverage unaffordable for millions more Americans. As Congress weighs major budget cuts and structural changes to Medicaid as part of its effort to repeal and replace the Affordable Care Act (ACA), majorities of the public are wary of those changes to the program that covers medical and long-term care for millions of low-income Americans, the latest Kaiser Family Foundation tracking poll finds. The poll gauges the public’s views on major Medicaid changes in the American Health Care Act, which narrowly passed the House May 4 but faces an uncertain future in the Senate. The House bill would significantly reduce federal funding to states that expanded their Medicaid programs to low-income adults under the ACA. A vast majority (84%) of the public say it is important that states that received federal funds to expand Medicaid continue to receive those funds under any replacement plan. This includes large majorities of Democrats (93%), independents (83%) and Republicans (71%). Support for continued funding for the Medicaid expansion is also popular among people living in states that have not expanded their Medicaid program. The poll also finds that the public prefers Medicaid’s current financing structure, with the federal government matching state spending on an open ended basis, to the proposed changes in the House bill, which would limit the federal government’s contributions through per capita caps or block grants while giving states more flexibility to decide who and what to cover under the program. When asked about this proposed change, seven in 10 (71%) say Medicaid should largely continue as it is today, while fewer (26%) say it should be changed to limit federal funding while letting states decide who and what to cover. Democrats and independents largely favor the status quo (90% and 70%, respectively) while Republicans split, with similar shares supporting the status quo (47%) and the alternative (48%). Overall six in 10 Americans (58%) say Medicaid is either “very” or “somewhat” important for them and their family, including a majority of Democrats (64%) and independents (57%), and nearly half (46%) of Republicans. When asked whether Medicaid is more similar to other health insurance programs or to welfare programs, more people see Medicaid as health insurance (60%) than welfare (37%). 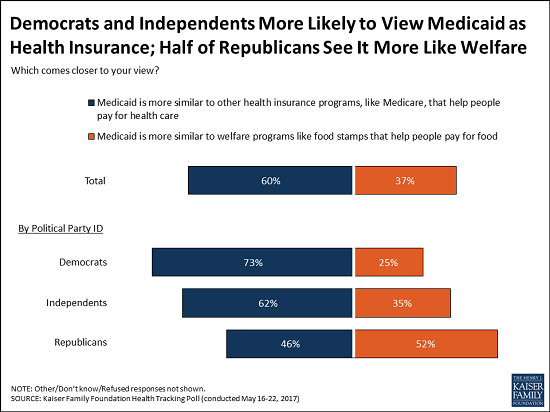 There is a significant partisan divide in these perceptions, with most Democrats and independents viewing Medicaid as health insurance and a narrow majority of Republicans viewing it as welfare. Designed and analyzed by public opinion researchers at the Kaiser Family Foundation, the poll was conducted from May 16 – 22 among a nationally representative random digit dial telephone sample of 1,205 adults. Interviews were conducted in English and Spanish by landline (421) and cell phone (784). The margin of sampling error is plus or minus 3 percentage points for the full sample. For results based on subgroups, the margin of sampling error may be higher. HIP 2.0 has been deemed a success in part due to the efforts of community health centers in Indiana. SEA 165, the bill that codified HIP 2.0 and its key components, was passed during the 2016 legislative session. Any major changes to the program would also need to be legislated which creates an obstacle. Proponents of the bill felt it was necessary to codify as a means of demonstrating the will of the legislature, locking in the program in the case of changes at the gubernatorial level, which are now a reality, and for future negotiations with CMS. Opponents of the bill were not in favor of some of the components of HIP 2.0 but also saw the bill as a means of locking in the program in the case that a change at the gubernatorial level could lead to the incumbent stripping the program. The program is strongly supported in the state and the drop in uncompensated care both at hospitals and health centers has been economically beneficial, the effects of which will continue to ripple out for years to come. Check out this article from Modern Healthcare below. Indiana’s Medicaid expansion will likely continue despite Gov. Mike Pence withdrawing from the state’s gubernatorial race to join Donald Trump as his running mate. Pence’s conservative version of Medicaid expansion took effect last year. His Healthy Indiana 2.0 plan—which includes premium contributions, health savings accounts, incentives for healthy behaviors, and a benefit lock-out for people who don’t pay premiums—has become a model for conservative Republican governors in other states such as Kentucky and Ohio. An hour after Pence dropped out the race Friday, Eric Holcomb the state’s lieutenant governor and Republican U.S. Reps. Susan Brooks and Todd Rokita made moves positioning themselves to become the GOP gubernatorial candidate. Local media pegs Holcomb as facing Democratic nominee John Gregg in November. Gregg, a former state representative, won his party’s state primary earlier this year. Holcomb hasn’t commented on HIP 2.0, but as Pence’s second in command, he likely supports the program, according to David Craig, an ethics professor at Indiana University–Purdue University Indianapolis. Both Brooks and Rokita issued statements of support after Pence received approval from HHS for HIP 2.0. Brooks has sided with Pence in a fight against the CMS. The agency wants to conduct an independent evaluation of how the Indiana waiver model has affected beneficiaries’ access to care. She and Pence argue the state has already hired a vendor to perform an evaluation and expressed concern that the CMS would be biased in its assessment. If Gregg wins, he might follow fellow Democrat Pennsylvania Gov Tom Wolf’s footsteps by junking his predecessor’s conservative Medicaid expansion and replacing it with a straightforward approach, said David Orentlicher, a health law professor at Indiana University. Regardless of who wins the election, providers believe that HIP 2.0 will remain intact given the program’s success and its strong, bipartisan support, said Indiana Hospital Association President Douglas Leonard. As many as 350,000 people are believed to have gained access through HIP 2.0. Others agreed. “It’s been implemented very well and is firmly in place,” said Philip Morphew, CEO of the Indiana Primary Health Care Association, which represents the state’s community health centers. “Any major changes to the program would also need to be legislated,” said Lisa Mangifico, a policy analyst at the Indiana Primary Health Care Association. The only scenario that might change that is if Republicans win the White House, maintain control over the House and Senate and follow through with threats to repeal the Affordable Care Act.